Aviation Updates Philippines - An Air Algerie jetliner with 116 people aboard crashed Thursday in a rainstorm over northern Mali, and officials said its wreckage has been found. The jet, an MD-83, disappeared from radar less than an hour after departing Ouagadougou, the capital of Burkina Faso, en route to Algiers. Officials in Burkina Faso said burned wreckage with human remains was located in Mali, 31 miles from the border with Burkina Faso. A search had been underway for wreckage in the remote region known for separatist violence. A U.S. official speaking off the record initially said one of the passengers was a dual U.S.-French citizen but later said the person had been on the flight manifest but did not board the plane and was at home in France. The official spoke on condition of anonymity because officials were not authorized to speak publicly about the identities of the passengers. It was the third major international aviation disaster in a week, following the downing of a Malaysian Boeing 777 over eastern Ukraine and the crash of a passenger plane off Taiwan. 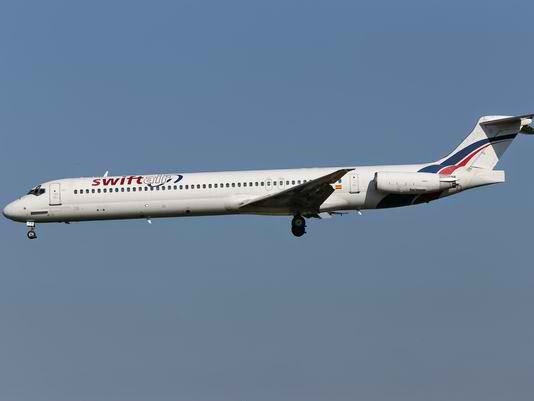 The plane was owned by Spanish company Swiftair and leased by Air Algerie. "We sent men, with the agreement of the Mali government, to the site, and they found the wreckage of the plane with the help of the inhabitants of the area," said Gen. Gilbert Diendere, a close aide to Burkina Faso President Blaise Compaore and head of the crisis committee set up to investigate the flight. "They found human remains and the wreckage of the plane totally burnt and scattered," he said. He told The Associated Press that rescuers went to the area after a resident said he saw a plane go down 50 miles southwest of Malian town of Gossi. Burkina Faso's government said the country will observe 48 hours of mourning. Malian state television also said the debris of Flight 5017 was found in the village of Boulikessi and was found by a helicopter from Burkina Faso. Algeria's transport minister also said the wreckage had apparently been found. French officials could not confirm the discovery late Thursday. "We found the plane by accident" near Boulikessi, said Sidi Ould Brahim, a Tuareg separatist who travelled from Mali to a refugee camp for Malians in Burkina Faso. "The plane was burned, there were traces of rain on the plane, and bodies were torn apart," he told AP. French President Francois Hollande said after an emergency meeting in Paris, "Everything allows us to believe this plane crashed in Mali." He said the crew changed its flight path because of "particularly difficult weather conditions." 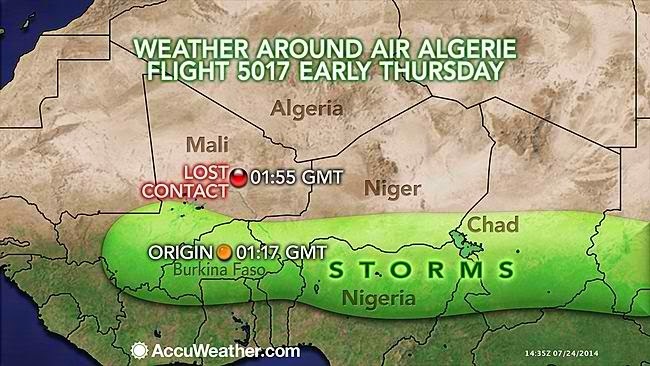 The airline said on Twitter that the plane went down about 40 miles from the Malian city of Gao. Before vanishing, the pilots sent a final message to ask Niger air control to change its route because of heavy rain, Burkina Faso Transport Minister Jean Bertin Ouedraogo said. AccuWeather meteorologist Anthony Sagliani said the thunderstorms were not particularly violent. "In general, there were scattered showers and thunderstorms across all of Burkina Faso and the southern half of Mali," Sagliani said. "This was with the monsoon trough, which is typically found here in late July. So this activity was quite normal." The passengers included 51 French, 27 Burkina Faso nationals, eight Lebanese, six Algerians, five Canadians, four Germans, two Luxembourg nationals, one Swiss, one Belgian, one Egyptian, one Ukrainian, one Nigerian, one Cameroonian and one Malian, Ouedraogo said. The six crewmembers were Spanish, according to the Spanish pilots' union. The deserts and mountains of northern Mali fell under control of ethnic Tuareg separatists and then al-Qaeda-linked Islamic extremists after a military coup in 2012. A French-led intervention scattered the extremists, but the Tuaregs have pushed back against the authority of the Bamako-based government. However, a senior French official said it was unlikely that fighters in Mali had weaponry that could shoot down a plane, the Associated Press reports. The official, who spoke on condition of anonymity because she was not authorized to speak for attribution, said the fighters have shoulder-fired weapons that could not hit an aircraft at cruising altitude. Though crashes of commercial passenger planes have become rare, it's not unprecedented for them to occur within a short time period.